I'm dropping in one more time today to share a huge giveaway happening over at Peace, Love, and Learning! 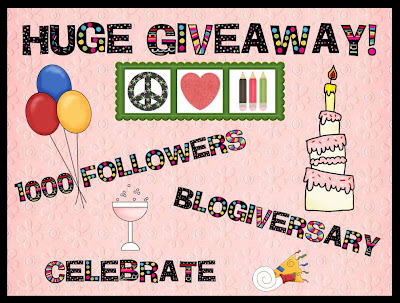 It's her blogoversary and she has tons of goodies up for grabs! How can I not share and enter?! If you are a teacher, make sure to stop by and check out her blog and the giveaway!